If you’re looking to improve your angling skills this summer, then a baitcasting reel could be the answer. Not only will it help you cast farther using a heavier line, but it’ll also give you a greater opportunity to catch larger fish in general. However, you can’t just go into the store and buy any old baitcasting reel you find because you might end up with something that’s completely useless for what you’ll be using it for. Plus, there are just so many different choices to pick from these days that purchasing anything can be a surprisingly daunting experience. Price is always a good place to start though, which is why we’ll be looking specifically at the best baitcasters under 100 dollars. 1 What is a Baitcasting Reel? 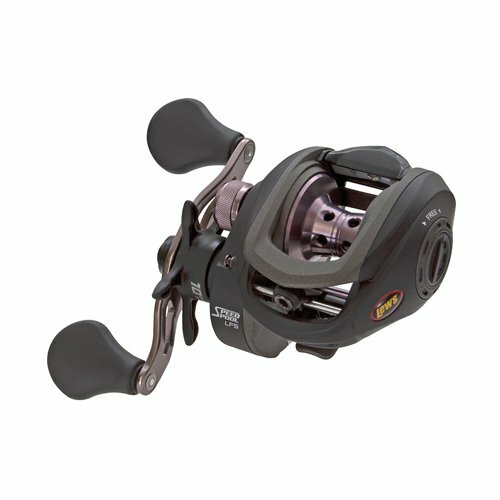 A baitcasting reel is unique in that it requires you to store your fishing line in a revolving spool which is supported by ball bearings. This process enables the spool to spin multiple times with each pull of the handle, which is why baitcasting reels with a high gear ratio are often preferred because they allow you to generate numerous revolutions of the spool with less effort. 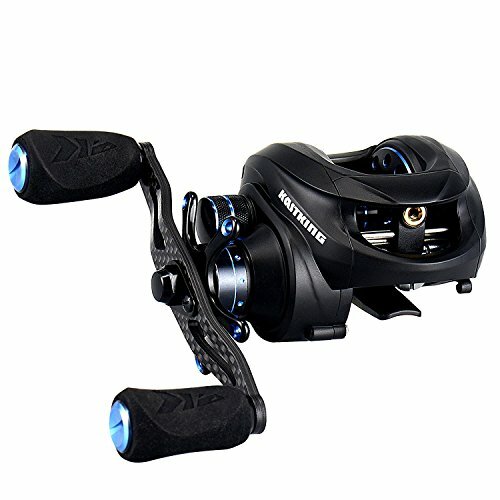 This unique construction is also what makes baitcasting reels so versatile, in that you can use them in any environment, and the fact that they come in different weights and sizes makes them suitable for both novice and experienced anglers alike. While spinning reels are considered to be a more user-friendly-option, baitcasting reels allow you to cast further into the water and can be utilized for more demanding applications and terrain. Also, spinning reels are mainly designed for casting light bait, whereas, with a baitcasting reel, you can use any lure you like, from spinner baits to crank baits and jigs. It’s safe to say that the market is awash with all types of baitcasting reels, many of whom promise great things. To help you narrow down your choices, we’ve put together a list of bait casting reels which in our opinion, are pretty solid options and are versatile enough to suit anglers of different experience levels and preferences. Weighing only 5.7ounces, this is one of the lightest baitcasting reels on the market, and yet it boasts a premium carbon frame construction and 17lbs of stopping power. 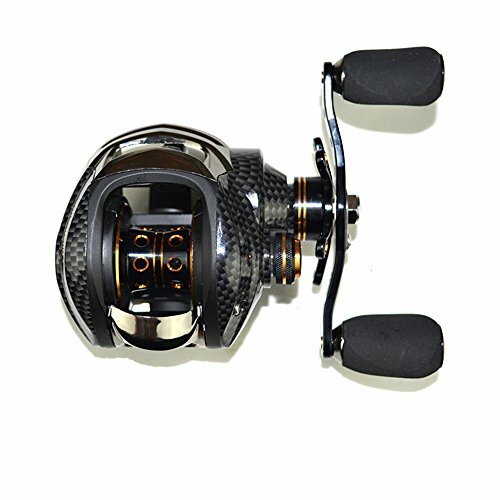 This reel also comes with 6+1 shielded and corrosion resistant ball bearings and a double brake system with both a magnetic and a centrifugal brake. The 105mm extended carbon crank handle on this reel will give you the added power needed to help you reel in great catches with ease. And to back its massive pulling power it has a gear ratio of 7.0:1. You’ll be glad to know that this reel comes with a 30-day money back guarantee on top of its 1-year limited warranty. This baitcasting reel from ROSE KULI has a solid build, and it’s compact and highly portable, as it weighs just 8 pounds. It’s also quite durable and has 12 ball bearings along with a one-way clutch. This baitcasting reel also features an impressive 19 pounds max drag and a VERY reasonable price tag...the lowest in this category. This ultra-lightweight baitcasting reel from KastKing weighs just 5.7 ounces and is made from carbon, a material that is naturally resistant to corrosion and so tough that it can practically withstand anything. 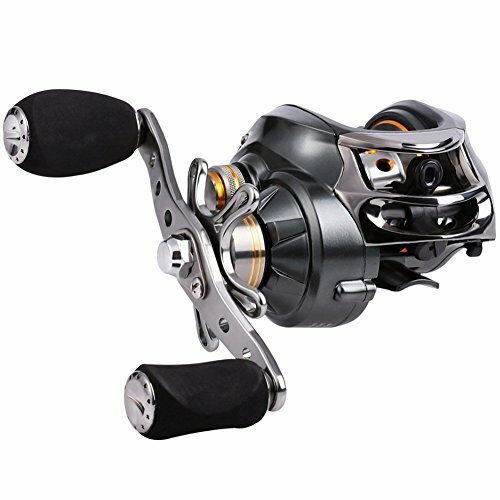 The 11+1 ball bearings are made from shielded and corrosion resistant MaxiDur, while the spool boasts hardy construction from aero-grade aluminum. It also features 16.5 pounds of stopping power, a two-brake system that includes centrifugal and magnetic brakes, as well as a gear ratio of 6.3:1. This reel also features a notably elegant and sleek design with a midnight black finish that’s highlighted by midnight blue accents. To top it off, it’s backed by an awesome 1-year warranty, so you know the manufacturer is confident about the quality. This low profile baitcasting reel from Piscifun is built to last and boasts a graphite composite body and reinforced gears with a max drag of 18 pounds. 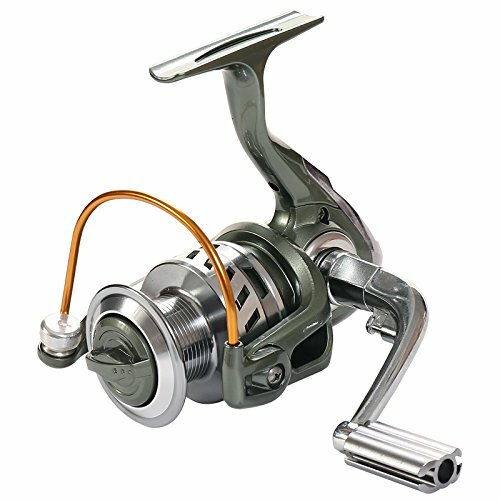 Other notable features on this reel include shielded stainless steel bearings that are long-lasting and offer a smooth butter cast. The high-tech magnetic brake will not only reduce backlash, but it also comes with a removable side plate for easy maintenance. The gear ratio on this Piscifun baitcasting reel is 7.1:1, with 5+1 ball bearings, and a 1-year warranty that’s accompanied by a 30-day money back guarantee. 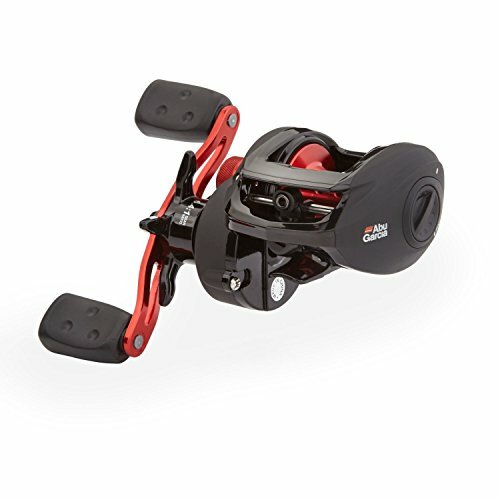 With its minimalist design and sleek black and red finish, this baitcasting reel is made for easy handling and smooth casting. A machined aluminum spool complements its sturdy graphite body, and it features a Power Disk system to make sure that you enjoy smooth drag performance. 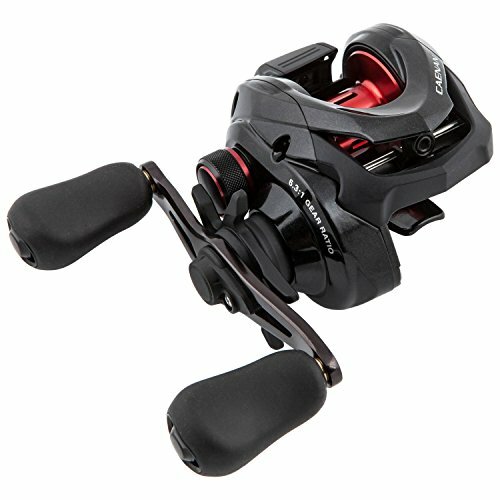 To control casting speed, it has a MagTrax braking system, and Abu Garcia has paid particular attention to the design of the handle, which comes with a grip-friendly recessed reel foot and compact bent handle. The gear ratio of this baitcasting reel is 6.4:1, and it weighs just 8 ounces with a right-hand configuration. 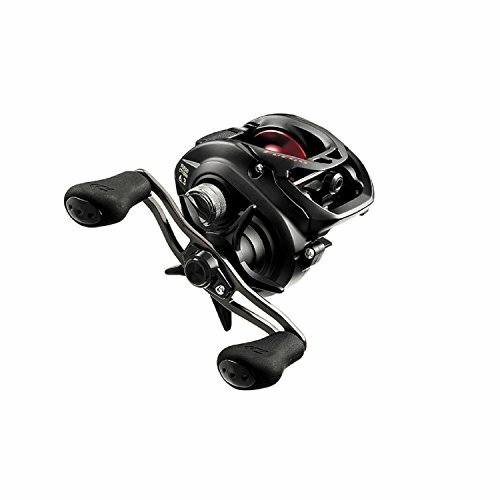 This lightweight baitcasting reel from Daiwa Fuego is easy to handle and weighs just 7.6 oz. It features a Carbon Drag of 13.2 pounds and comes with 5+1 ball bearings, an anti-reverse, air rotating aluminum frame, and Magforce-Z cast control. It also comes with a magnetic braking system, adjustable cast control, a swept handle with a comfortable grip and a compact design that makes it easy to travel with. 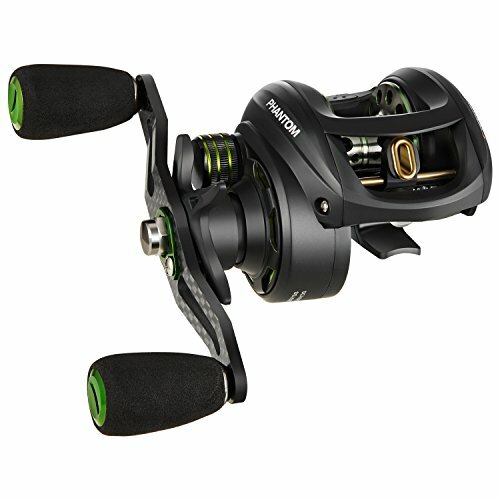 With its sturdy aluminum frame and removable graphite side plates, this reel is as durable as it is easy to maintain. The spool is made from robust anodized aluminium, and it uses a magnetic brake system that makes it easy to control. All 9 of its stainless steel bearings are shielded, and it comes with one Zero-Reverse anti-reverse bearing as well. Its Rulon drag system means that you’ll have 10 pounds of drag power to work with. Its gear ratio is 6.8:1, and it has a zirconia line guide, custom paddle knobs from Lews on the handle, as well as an external lube port that makes for a more straightforward setup. Although it’s made from super durable and corrosion-resistant carbon, this baitcasting reel is very light and weighs only 7.6 oz, which makes it ideal for an all-day fishing excursion. It features 11+1 shielded ball bearings, all of which are made from Corrosion Resistant MaxiDur, a magnetic brake system that goes from 0-9, a machined aluminum spool, and a high-tech 3 Disc Carbon Fiber Star Drag System that gives you 18 pounds worth of drag power. To top it off, this baitcast reel comes with a high gear ratio of 7.0:1, and a 1-year warranty backs it. This durable baitcasting reel from Shimano comes with a gear ratio of 7.2:1 and yet it only weighs 7.2 pounds, and features High-Efficiency Gear that gives you a super smooth retrieve. 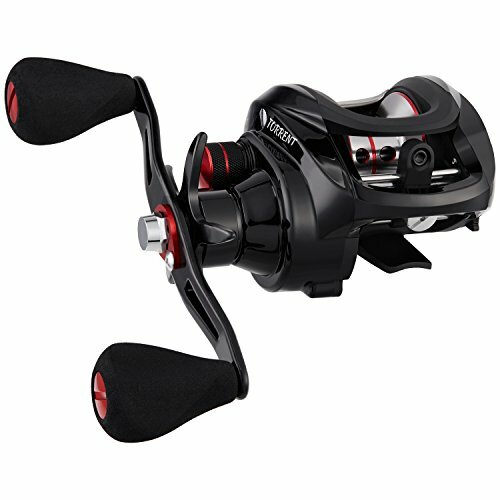 It’s a low profile reel with a max drag of 11pounds and 4+1 ball bearings with a sleek black design. Lixada has managed to combine performance with good looks in this 7.3 ounze baitcasting reel, which has a gear ratio of 7.0:1, 17+1 stainless steel ball bearings, a decent max drag of 12 pounds and a dual brake system. It’s constructed from a combination of high strength nylon and polished metal and features a CNC machined aluminum spool as well as a handy Soft EVA handle knob, which makes for a sturdy grip and effortless control. Baitcaster reels have been around for centuries, and even though they’ve gone through a few renditions since they were first invented, they still remain the most versatile reel option for anglers. With a baitcasting reel, you can enjoy the same precision regardless of the type of terrain you’re angling in, and this includes tough environments like weed beds and Lilly ponds for example. This is what makes baitcasting reels a logical next step once you’ve gotten tired of, or reached the limits of spinner reels. Good ones are lightweight, easy to control and long lasting.